Fellow “RiffTrax” fans and “Mystery Science Theater 3000” MSTies will be interested in a live movie-riffing event of a cult creature feature from coast-to-coast. Artwork for the upcoming “RiffTrax Live!” edition of “Octaman” (1971). 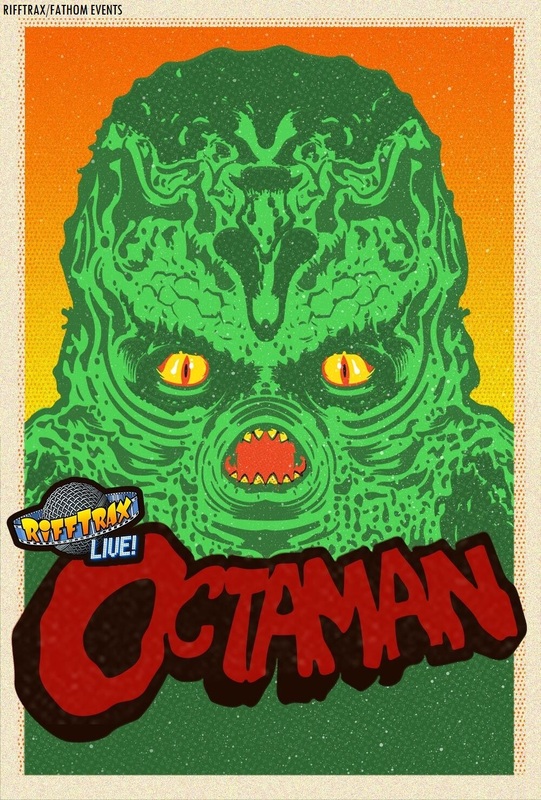 RiffTrax, in conjunction with Fathom Events will be presenting “RiffTrax Live: Octaman” in participating theaters from coast-to-coast with a live theatrical telecast on Thurs., April 18 at 8 p.m. Eastern/7 p.m. Central (local time, according to Fathom Events’ site). A pre-recorded encore will occur in participating cinema venues from coast-to-coast on Wed., April 24 at 7:30 p.m. (all times local, according to Fathom). Featuring “Mystery Science Theater 3000”/MST3K alums Mike Nelson, Kevin Murphy and Bill Corbett; the “RiffTrax Live: Octaman” presentation will be broadcast live to participating cinema locations throughout the country, via satellite from the Belcourt Theatre in Nashville, Tennessee. The RiffTrax crew will be riffing the cult creature feature, “Octaman” (1971). “Octaman” was directed and written by Harry Essex. Essex was known for writing the screenplay for Jack Arnold’s Universal sci-fi classic, “It Came from Outer Space” (1953) and Arnold’s Universal monster creature classic, “Creature from the Black Lagoon” (1954). The players who appeared in Essex’s 1971 creature feature entry were Pier Angeli (as Susan Lowry), Jeff Morrow (as Dr. John Willard, Morrow previously appeared in Joseph Newman’s 1955 Universal sci-fi classic; “This Island Earth” in the role of Exeter), Kerwin Matthews (as Dr. Rick Torres, Matthews previously appeared in the title role of Captain Sinbad in the 1958 Ray Harryhausen–Charles H. Schneer–Columbia classic, “The 7th Voyage of Sinbad”), Read Morgan (as the “Octaman”), Jerome Guardino (as Johnny Caruso), David Essex (as an Indian, David Essex is the real-life son of Harry Essex), Robert Warner (as Steve), Buck Kartalian (as Raul). According to Fathom Events’ official site, the creature make-up effects for the “Octaman” creature were created by a young Rick Baker; who went onto greater fame for his work in the fields of make-up and creature effects in modern cinema. Fellow Svengoolie SvenPals everywhere will be jumping for joy for his upcoming big broadcast of Universal Studios’ legendary comedic duo in a space-age comedy classic! 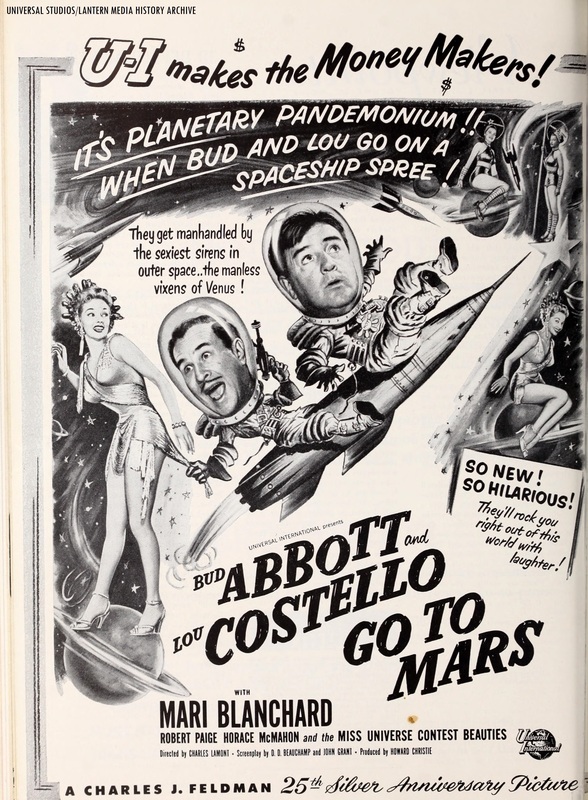 Universal Studios‘ exhibitors ad for “Abbott and Costello Go to Mars” (1953), published as a tie-in in honor of Universal executive Charles J. Feldman. The legendary Berwyn/Chicago sci-fi film host will present his big broadcast showcase of “Abbott and Costello Go to Mars” (1953), this Sat., Feb. 9 at 8 p.m. Eastern/7 p.m. Central on Me-TV. Abbott and Costello’s 1953 Universal sci-fi comedy entry was directed by veteran director Charles Lamont. 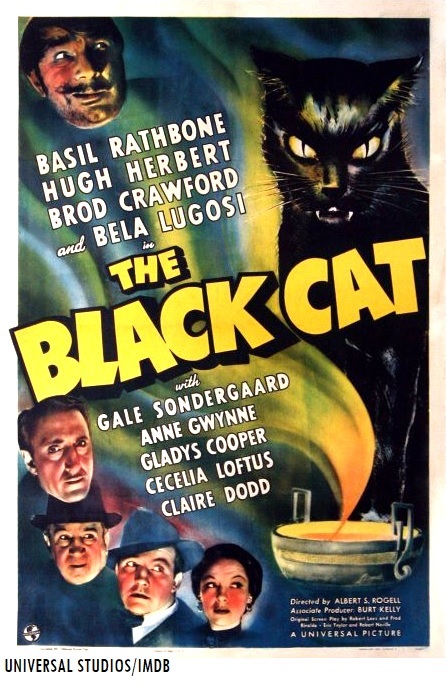 Lamont also worked on “Abbott and Costello in the Foreign Legion” (1950), “Bud Abbott and Lou Costello Meet the Invisible Man” (1951), “Abbott and Costello Meet Captain Kidd” (1952, with Charles Laughton for Warner Bros. release), “Abbott and Costello Meet Dr. Jekyll and Mr. Hyde” (1953, with Boris Karloff), “Abbott and Costello Meet the Keystone Kops” (1955) and “Abbott and Costello Meet the Mummy” (1955, the duo’s final feature). Lamont also directed several Universal “Ma and Pa Kettle” comedies with Marjorie Main and Percy Kilbride; including “The Further Adventures of Ma and Pa Kettle” (1949, a.k.a. “Ma and Pa Kettle”), “Ma and Pa Kettle Go to Town” (1950), Ma and Pa Kettle on Vacation (1953) and “Ma and Pa Kettle at Home” (1954). This will mark Sven’s fourth big broadcast of “Abbott and Costello Go to Mars” (1953) on Me-TV. He previously showed Abbott and Costello’s 1953 Universal sci-fi comedy feature back in Dec. 2012*, July 2016 and April 2018.
Who was in “Abbott and Costello Go to Mars” (1953)? The players who appeared “Abbott and Costello Go to Mars” (1953) were Bud Abbott (as Lester), Lou Costello (as Orville), Mari Blanchard (as Allura), young Anita Ekberg (two years before, Ekberg won the 1950 Miss Sweden competition), Jackie Loughery/Miss USA 1952, Judy Hatula (a.k.a. Judy Jorell)/Miss Michigan 1952 and Jeri Miller/Miss Long Beach 1952 (as Venusian Guards); Ruth Hampton/Miss New Jersey 1952, Elsa Edsman/Miss Hawaii 1952, Valerie Jackson/Miss Montana 1952, Renate Hoy/Miss Germany 1952 and Jeanne Thompson/Miss Louisiana 1952 (as Handmaidens); Jean Willes (as Capt. Olivia), young Harry Shearer (in a non-credited role as a young boy), Robert Paige (as Dr. Wilson; Paige previously appeared with Bud Abbott and Lou Costello in the duo’s 1942 Universal comedy, “Pardon My Sarong”), Horace McMahon (as Mugsy), Jack Kruschen (as Harry), Martha Hyer (as Janie Howe), James Flavin (as the bank Police officer) and Joe Kirk (as Dr. Orvilla). Fellow Svengoolie SvenPals everywhere will be jumping for joy for his big broadcast of a classic Columbia Pictures space comedy with cinema’s legendary comedy trio. 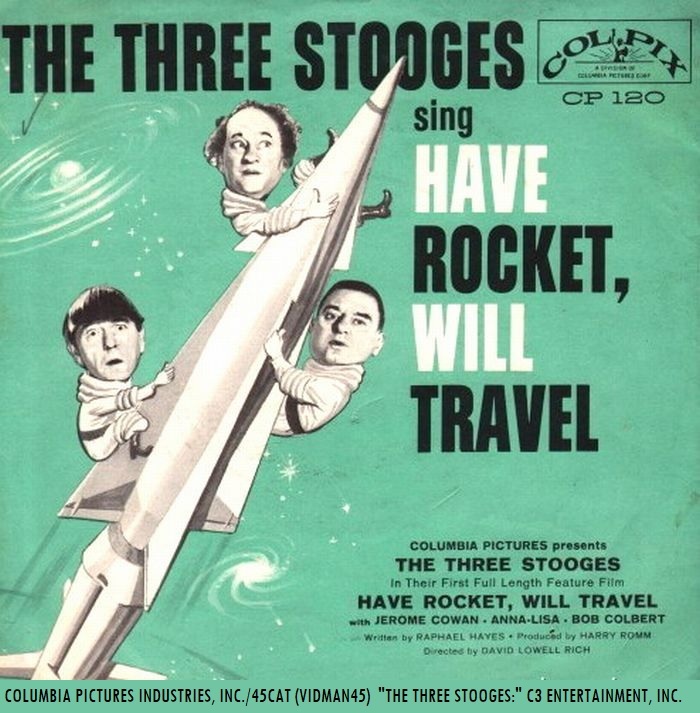 1959 Colpix Records (Columbia Pictures) 45 RPM sleeve for the single release of the title song to “Have Rocket, Will Travel” with “The Three Stooges,” Moe Howard, Larry Fine and “Curly Joe” DeRita. The legendary Berwyn/Chicago-based sci-fi film host will present his big broadcast showcase of “Have Rocket, Will Travel” (1959) with “The Three Stooges,” this Sat., Dec. 22 at 8 p.m. Eastern/7 p.m. Central on Me-TV. The Stooges’ 1959 Columbia feature-length space comedy entry was directed by David Lowell Rich. Rich also worked on “Hey Boy! Hey Girl!” (1959, with Louis Prima, Keely Smith and James Gregory), several episodes of Stirling Silliphant and Herbert B. Leonard’s “Route 66” (1959-63, with Martin Milner and George Maharis) and “Madame X” (1966, with Lana Turner, Constance Bennett, Ricardo Montalban, John Forsythe, Burgess Meredith and Keir Dullea). This will mark Sven’s second coast-to-coast big broadcast of the Stooges’ 1959 Columbia feature-length space comedy on Me-TV. Sven previously premiered “Have Rocket, Will Travel” (1959) as part of his big broadcast from coast-to-coast back in April 2018.
Who was in “Have Rocket, Will Travel” (1959)? The players who appeared in “Have Rocket, Will Travel” (1959) were Moe Howard (as Moe), Larry Fine (as Larry), “Curly” Joe DeRita (as Curly Joe; DeRita appeared in Columbia’s non-Stooge comedy shorts, beginning with 1946’s “Slappily Married;” DeRita later joined Moe Howard and Larry Fine as a “Stooge” for various touring appearances one year before “Have Rocket Will Travel,” according to Lisa Mateas’ Turner Classic Movies article ), Anna Lisa (as Dr. Ingrid Naarveg), Jerome Cowan (as J.P. Morse), Don Lamond (in multiple roles as the introductory narrator of the full-length Columbia “Stooge” space comedy, a news reporter and the voice of the Venusian Robot),Dal McKennon (in an uncredited role as the voice of the Unicorn), Marjorie Bennett (in an uncredited role as Mrs. Hermine Huntingford) and Robert “Bob” Colbert (as Dr. Ted Benson). Fellow fans of RiffTrax, MSTies of “Mystery Science Theater 3000” and aficionados of science fiction cinema will be interested in an upcoming coast-to-coast riffing event. Poster artwork for the upcoming “RiffTrax Live!” rendition of “Krull” (1983). RiffTrax, in association with Fathom Events and Columbia Pictures will be presenting “RiffTrax Live: Krull” in select cinema venues nationwide on Thu., Aug 23 at 8 p.m. (local time). A pre-recorded encore will occur on Sat., Aug. 25 at 8 p.m. (local time). Featuring MST3K alums Mike Nelson, Kevin Murphy and Bill Corbett, the “RiffTrax Live: Krull” presentation will be broadcast live to participating cinema locations nationwide via satellite from the Belcourt Theatre in Nashville, Tennessee. The RiffTrax crew will be riffing “Krull” (1983), which was directed by Peter Yates (who directed “Bullitt” in 1968 with Steve McQueen and “Breaking Away” in 1979 with Dennis Quaid). The film was released theatrically in July 1983 (according to IMDB). Who was in “Krull” (1983)? 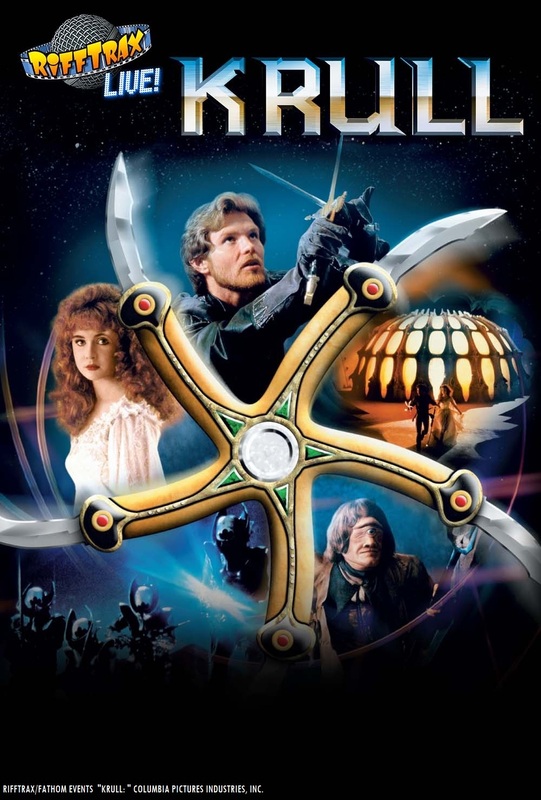 The players who appeared in Yates’ “Krull” (1983) were Ken Marshall (as Colwyn), Lysette Anthony (as Lyssa), Liam Neeson (as Kegan), Freddie Jones (as Ynyr), Francesca Annis (as the Widow of the Web), David Battley (as Ergo), Alun Armstrong (as Torquil), Bernard Bresslaw (as the Cyclops), John Welsh (as Seer), Graham McGrath (as Titch), Bernard Archard (as Elrig) and Belinda Mayne (as Vella).